Never have I had to write something as difficult as I have for today. My Aunt Becky has meant so much to me and to have such a beautiful light suddenly turn dark and go out for no obvious reason is beyond comprehension. Growing up, Becky was always right down the street, ready for the unexpected dropping bys and holidays that brought our family together. It was comforting to know she was so close and always happy to see me. When she left for college and the army, she kept in touch through letters and emails. It is hard for me to believe she is gone. Becky was the coolest aunt any niece could ever wish or hope for. She being only four years older than me, made it easy to relate to her. She wasn't some far away relative, both in time and geography; we were practically the same age. Becky relished in the idea she was older, and therefore wiser. She never let me forget that, and it was okay because I looked at her as there to help guide me, though neither of us knew it at the time. Although I always introduced her as my aunt, I thought of her as a much closer relative, the older sister I never had. Some fondest memories of mine are of going to Becky's to visit during the school years and being babysat by Becky during the summer. I remember us playing with teeny Fischer Price men and women; Becky had all the cool toys, a complete Fischer price world: an airport, parking garage, houses, barns, cars, zoos, we would set them up all over the house to make up that world, rooms became towns and hallways became the superhighways that connected those towns. From Fischer Price we advanced to Barbies, and like with the Fischer Price toys, we turned the house into another world we had created through our imaginations. We also played school, Becky being the oldest therefore was always the teacher. I wonder if Becky ever realized that she helped to get me ready for the real world through our play. I think she just liked being the eldest and the one in charge. We both eventually grew out of playing with dolls and became interested in much more mature things. For instance, I have Becky to thank for the wonders and joys of second-hand shopping, namely, the hidden treasures of the Village. The first time I walked in the store with her, I was shocked she would choose such a shabby place, stinking of mothballs and air freshener, to shop in. I kept asking her exactly what was that smell, and what we were doing there. She didn't let these complaints stop her; instead she dove right into the racks and began rummaging for bargains. Having nothing to do but dive in or be bored for the next hour or so, I soon found myself fighting with her over the ugliest but most unique sweaters, dresses and blouses. Luckily we were able to settle these disputes by trying the items in question on. The winner of the article of clothing was the one who it fit best or who it looked the best on. I was soon a regular at Village and became adept at finding the trendiest clothes and at low prices. Becky also unlocked for me the secrets of makeup and hair. For her high school graduation breakfast, she decided to include me in the preparation for the event; mainly the ritual of applying lipstick and hairspray. I have to say I was quite done up that day, with untamed curly hair, bright red lipstick, blush and thick black mascara. When I was dropped off at home after the breakfast, I was quite a shock to my mother, but I thought I looked pretty good, grown-up like. I had become one of her Barbie dolls and proudly. We soon began to use the nickname Dolly for each other. 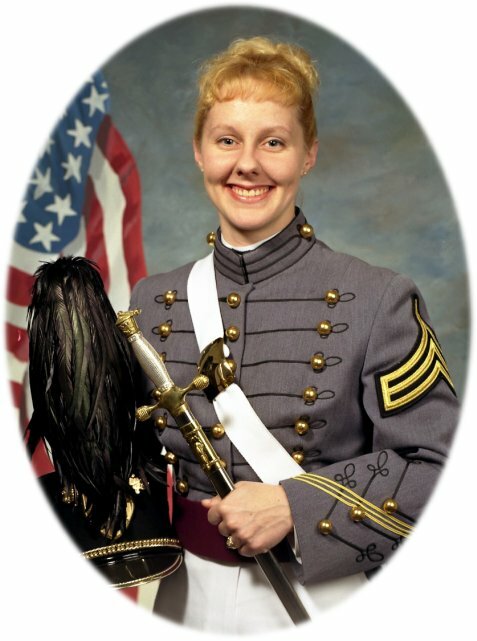 When she left for West Point, she wrote the occasional letter to let me know how she was doing. She even met me in New York City for a couple of crazy nights out on the town while she was still in school. Whenever she came home to visit from far away places like Korea, Germany, Iraq and Kuwait she always had some little trinket to bring home for me as a souvenir, she was always thinking of her family. Making the trip to Germany to visit her was one of the best times of my life and she took me on an amazing day trip to Strasburg I will never forget. Becky was always willing to share whatever she had, whether it was her experiences, a couple rooms of her apartment in Germany or her love. The last time I saw Becky was the weekend of my sister Sarah's wedding in May. It is so strange to think that was only several months ago. It was a good time, and while she was here she made it a point to make the most of the short weekend she was home. One of her favorite bands was playing at an intimate venue in Cleveland, The House of Blues. She called me up and asked if I wanted to go see the show, and if I could go online and find out how much the tickets were. I did, and saw it was sold out. I called her back to let her know and to ask if she wanted to make other plans but she said no. She said she didn't care if the show was sold out; she was driving up there to see it and to be ready in half an hour, she was coming to pick me up. Exactly half an hour later she was in my driveway beeping the horn. I tried to dissuade her by saying there was no way we were getting in, but she was determined. I indulged her by sitting back and enjoying the ride, thinking we weould be getting an early dinner instead of tickets to the show. We arrived in front of The House of Blues and soon enough, a scalper began waving tickets around. Becky pulled up to the man and they both started to haggle. I remember her being very professional and nonchalant about the whole thing and she got the tickets at a pretty good price. That was Becky for you; Always knowing what she wanted and how to get it and in control the entire time. It was what I liked about her the most. She was so confident, how could anyone not want to be like her? I will always remember her as my Aunt Becky, my Dolly, and I will forever keep her memory close to my heart.